Let’s face it, the words ‘pie’ and ‘pasty’ don’t exactly conjure up an image of virtuous healthy eating. The phrase “Who ate all the pies?” was obviously conjured up for a reason, and that is that your average pie is fat laden and not exactly brimming with nutritional value. More recently, the humble pie has started to try and go more up market, with gourmet fillings and usually some kind of ‘home cooked’ association that makes you think more of days gone by and home cooking than a processing plant in the midlands. The pie is definitely a British food staple, as is the much maligned pasty, so what can you expect from these two delicacies in the 21st century? It’s probably fair to say that the pasty at least is enjoying something of a revival, with the emergence of shops on the high street and railway station kiosks selling what could well be one of Cornwall's most famous exports. Even uber trendy Covent Garden in London now has pasty shops, and sales at the most well known outlet, the West Cornwall Pasty Company, are rising year on year as the delicacy gains in popularity. The perception of a pasty as being somehow more wholesome than a pie could be the key to the rise in popularity, well, that and some clever marketing. 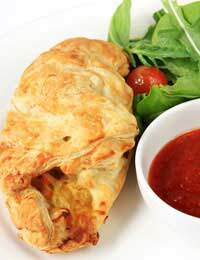 People see (and smell) the freshly-baked pasties and seem to see them as a slightly healthier alternative to burgers or chips, possibly because most pasties do actually include some vegetables, along with straightforward ingredients – and not so many nasties. The act of wrapping meat and two veg in pastry and baking them isn’t confined to British culture; versions of the pie appear across the globe. Pies to go are an obvious development, whether we’re talking about a traditional British pork pie or an Indian Samosa. The days of the delicious yet fattening pie or pasty could be numbered if UK Health experts get their way. In January 2009, Ben Bradshaw dropped hints that as part of a new government health drive, it could be made illegal to sell unhealthy foods...and by unhealthy of course they mean anything that contains over a certain level of fat, salt and sugar. The move would be likely to cause an uproar, so it’s unlikely that it will be enacted, but if you’re a pie fan, watch this space...He will decide whether to legislate to ban pies, pizza and some other junk food favourites on the basis of the latest health initiative ‘Change4Life’ which was launched in January 2009. He said that if the initiative doesn’t work to bring down the number of obese people in England, the government doesn’t rule out legislating!